I followed with I didn't want to go to hell either so that is why it is important to obey God and part of obeying God is listening to Mama and Papa and praying and being nice to other people etc etc. Then somehow the conversation turned to Jesus being in heaven. "Jesus is alive so He cannot be in heaven"
Oh but He is in heaven, I told her. He died and then went to heaven. When we die our bodies are put in graves and our soul leaves the earth. Our body and soul separates. "So they just leave our bodies out???" No someone will put it in a grave. If you follow God your soul will live in heaven. God can do anything He wants to and that's what He wants. "Well I want to go to heaven"
All this was happening I was getting the snacks and drinks and bags ready for school. I was getting something out of the frig and I thinking about what to say next - "If you get to heaven, will you try and find me?" But I could not get it out. Tears started welling up. I bit my lip and then the conversation turned to something else. 1. As much as her little 4 yr old self can drive me bonkers - by licking the sliding glass window after eating half a can of tuna (yep she did this at lunch today) - I cannot imagine what life would be without her. Life here on earth and life in heaven (hopefully). Makes me want to live the most godly life possible so that on the day of judgement I will be granted entrance into God's eternal Kingdom. 2. I wonder what God feels like when He cannot find one of His children in heaven? His love for us is so much bigger and greater and more perfect than the love I have for my kids; it must be that much bigger and greater and painful to Him. In case you are wondering, this conversation is not totally out of left field. 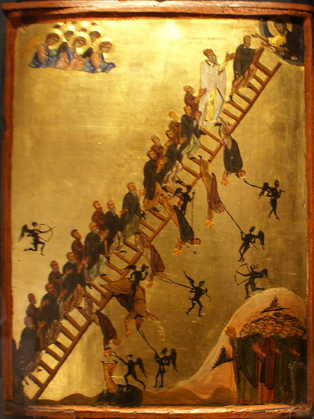 It is brought to you by St. John Climacus and the Ladder of Divine Ascent. We have this icon in our chapel and E was asking about it last week. We talked about how the ladder is our life and we need to live our life with our eyes on Jesus (who is at the top of the ladder) so that we can go to heaven. And the devil (and his minions as seen above) will try and tempt us with evil and sometimes it is hard to do the right thing but if we keep our eyes set on Christ, He will help us through it. Whew! And it wasn't even 7:20. Totally tearing up with you at thought. It's a very tough subject. You need to be very careful how to approach the situation but you handled the conversation very good! What an amazing Mama you are! !